The Travel Scientists (CEMS) is an award-winning international event planning and production company. We specialize in staging high profile functions throughout the world from Las Vegas seminars all the way to expedition level motor sport rallies in places as diverse as Asia, Africa and Europe. With offices in several countries in key locations across the globe we are in a strategic position to create spectacular events with full multi-media support and promotion. We can also create custom events for corporations or individuals in India or anywhere in the world. If you like what you see and want to take it in new direction let us know. Organising participants from around the globe to converge on India for the adventure of a lifetime takes a lot of planning and logistics. Our mission is to ensure your time is spent soaking up the experience rather than worrying about whether you will have a bed for the night or be stranded half way up a mountain pass with a broken rickshaw. Over the years we’ve been through the highs and the lows, the successes and the disasters to be able to develop the optimum package that balances thrills with a conscientious approach to both the participants and locals alike. Don’t be mistaken, these trips are not for the faint-hearted and in India anything can and does happen. Our experience and comprehensive planning ensure you can enjoy the rawness and exhiliration of exploring beyond the tourist trail in the knowledge that you are backed up by India’s longest established and most experiences Rickshaw Adventure operator. 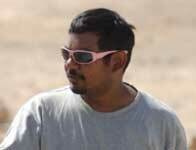 Aravind is the brain behind and the lead organizer of the Rickshaw Challenge. He’s a real cosmopolitan sharing his time between Europe and India. He runs an internet marketing company in Budapest, meanwhile he started the first “boutique” hostel in India. He also raced in Africa several times and assisted with adventure rallies all over the globe. If it’s got a motor, a bad road and a party at the end you can almost guarantee he’ll have been there at least once. Princely heads the Indian operations. A jolly good guy who among many accomplishments holds a record as ‘winner of Idly (rice cake) eating competition’ in university days. Dabbled in the printing, binding business before finding his true calling here in the Rickshaw Challenge. His relaxed personality is a great compliment to all the activity a massive international event tends to generate. With a background in psychology studies, digital art and international travel he brings a rich sense of diversity and experience to these events.